The authorities responsible for immigration in Canada, have conducted an Express Entry Draw. It is the largest draw till date, from the time, when changes were made in the draw format. 3,500 candidates obtained Invitations to Apply, to seek Canada Permanent Residence various programs. Here the minimum CRS score was 444, which is two notches, below comparing to the previous draw. 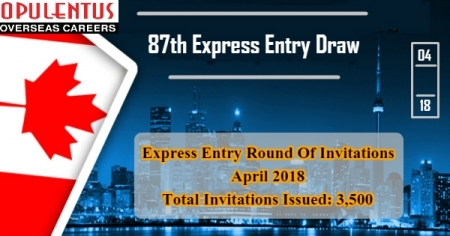 This was the first draw of April and the seventh round of invitations in 2018. Moreover, it was the 87th draw overall. Using the fresh format, the authorities can now go for issuing a specified number of invitations. In case, the number of applicants, receiving the lowest score, exceeds the volume of permitted invitations, they can implement the tie-breaker. This mechanism issues invitations which are based on the basis of the arrival time. In case, the candidates are more having the same minimum score, it gives importance to the date and time of forwarding the Express Entry profile. The most number of candidates to receive the invitation in a draw is 3,500.For the present draw, the cut-off score was 444. Consequently, in the new format, the officials can have better control in implementing a refined method to choose the candidates exactly for issuing an ITA. In the past, this was not possible. Again, in this draw, the minimum CRS score was below 500. The Express Entry immigration system was implemented by Canada on January 1, 2015. It supervises the applications of all skilled professionals by using the Federal programs. The programs include Canada Experience Class, Federal Skilled Worker Program, and the Skilled Trades Program. There are some Provincial Nomination Programs also. There is a likelihood of holding nearly 30 draws to invite 70,000 applicants in the present year. Also, most of the draws will have CRS scores which are close to 450, helping the immigration officials to meet the yearly target. However, Employers must secure the mandatory LMIA in the PNPs to retain the employees for a long time. It has a meaning for the Candidates, and they can succeed by just scoring near to 450 points. Consequently, many applicants can migrate Canada without having a nomination or job offer in the provincial programs. To be safe, getting an approved employment offer of is good.